The patent-pending MPBZ is specifically designed to provide moment resistance for columns or posts. An innovative overlapping sleeve design encapsulates the post, helping to resist rotation around its base. It is available for 4x4, 6x6 and 8x8 posts. The MPBZ is ideal for outdoor structures, such as carports, fences and decks. Built-in standoff tabs provide the required 1" standoff to resist decay of the post while eliminating multiple parts and assembly. Additionally, the MPBZ is available in ZMAX® as the standard finish to meet exposure conditions in many environments. Install MPBZ before concrete is placed using embedment level indicators and form board attachment holes. Place post on tabs 1" above top of concrete. Concrete level inside the part must not exceed 1/4" above embedment line to allow for water drainage. Annual inspection of connectors used in outdoor application is advised. If significant corrosion is apparent or suspected, then the wood, fasteners and connectors should be evaluated by a qualified engineer or inspector. This two-page flier provides product information and technical details for all three sizes of the moment post bases. A four-page flier providing product information, illustrations and load tables for the new MPBZ moment-resisting post base. Higher download can be achieved by solidly packing grout in the 1" standoff area before installation of the post. Allowable download shall be based on either the wood post design or the concrete design calculated per code. Tabulated rotational stiffness accounts for the rotation of the base assembly attributable to deflection of the connector, fastener slip, and post deformation. Designer must account for additional deflection attributable to bending of the post. Foundation dimensions are for anchorage only. Foundation design (size and reinforcement) by Designer. Allowable load shall be the lesser of the wood assembly or concrete allowable load. 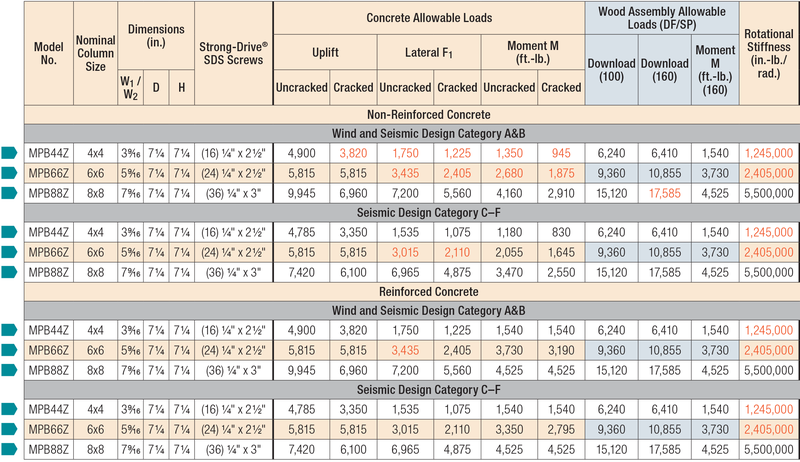 To achieve full wood assembly allowable moment loads, additional concrete design and reinforcement by Designer is required. For loading simultaneously in more than one direction, the allowable load must be evaluated using the following equation: (Design Uplift / Allowable Uplift, or Design Download / Allowable Download) + (Design Moment / Allowable Moment) + (Design Lateral / Allowable Lateral) ≤ 1.0. To account for shrinkage up to 3%, multiply rotational stiffness by 0.75. Reduction may be linearly interpolated for shrinkage less than 3%.